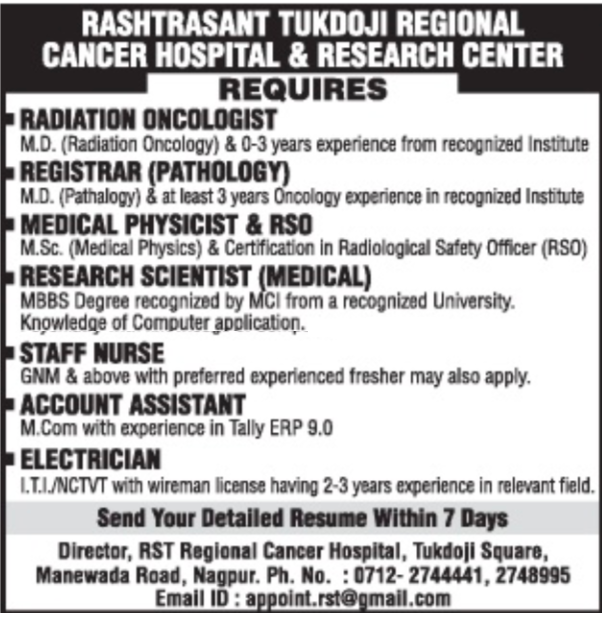 RST Regional Cancer Hospital Nagpur (Rashtrasant Tukdoji Regional Cancer Hospital & Research Center Nagpur), Nagpur published a new job notification for Radiation Oncologist, Registrar, Research Scientist, Medical Social Worker, Staff Nurse, Account Assistant, Electrician Posts. The willing candidates are informed to see the latest notification March 2019. Qualification required ITI/ NCTVT/M.com/GNM/MBBS/M.Sc./M.D/Post Graduate Degree and More. Last Date of offline application is 02-04-2019. For More details of RST Regional Cancer Hospital Nagpur Recruitment 2019 Read Below. Education Qualification: ITI/ NCTVT/M.com/GNM/MBBS/M.Sc./M.D/Post Graduate Degree and More. For Post wise Education Details follow the detailed advertisement. Interested & Eligible candidates can send their application along with all the necessary documents and testimonials to Director, RST Regional Cancer Hospital, Tukdoji square, Manewada Road, Nagpur.